Arctic Sea Ice Increases Past FOUR MILLION Square Kilometers For The First Time Since Records Began! Unprecedented 4 MILLION Sqkm Benchmark Smashed! 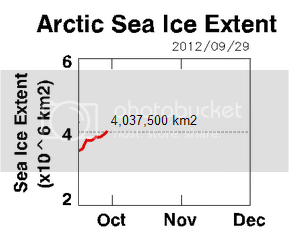 Never before has Arctic Sea Ice increased from below 4 million square kilometers to above 4 million square kilometers. Will the mainstream media now correct their discredited claims made just a month ago that the Arctic is melting? IPCC Didn't See It Coming! They Expected Melt! Crisis Meeting with Al Gore. IPCC big wigs will be in crisis talks with Al Gore tonight as Arctic Sea Ice unexpectedly froze past 4 million square kilometers for the first time in history according to Japanese Data . The new data reveals the Earth to be in a Cooling Mode and undermines Anthropogenic Global Warming, which is revealed to be based on nothing less than the recently discredited Laws of Thermodynamics. DenialDepot is officially sounding an Ice Age Alert for all Northern Hemisphere countries. In the next 4 months: Expect Colder Temperatures than you've experienced in the last 4 months. If you or your family live in the following countries Be Prepared. Keep reading Denial Depot for Ice Age Alert updates. Lobby your congressman to reduce taxes and relax regulations on banks and industry. Sea ice is quite topical at the moment. How is sea ice doing? Reliable Antarctic sea ice data indicates that we will have another Catastrophic Ice Age this winter. So much for the proven myth of Global Warming . It's now time to raise the alarm and inform your neighbors and work colleagues that Global Cooling is coming. If we act fast enough we can possibly make sure governments around the world do absolutely nothing. In contrast nothing remarkable is happening in the Arctic. There's been some melting this summer but that's expected. Arctic Sea Ice melts all the time, it's perfectly normal. For example I remember when the Vikings surfaced a longboat at the North Pole in 1955 and fought a pitched battle with a 15th century Chinese Navy. Lets start with what we DON'T know. Science is FULL of uncertainties. The uncertainty monster. Like most monsters, the uncertainty monster is a very reassuring thing to have around. To cut to the chase: we know absolutely nothing that could be used to increase taxes. So what DO we know? Preventable Catastrophic Anthropogenic Global Warming (PCAGW) is a myth invented by a cabal of New World Order politicians plotting to achieve a communist utopia . The world is in a steep Global Cooling trend and heading for another Ice Age this winter. Arctic sea ice is fine. Thick and healthy and highly resistant to the imposition of taxes. I took a brief look at the Arctic sea ice data and spotted a lot of downward trends had appeared in the data recently. That can only mean systematic fraud. So like any Blog Scientist I had to find something wrong with the data. Arctic Ice Satellite Fraud Gate is the catchy name I am giving to the latest scandal involving multiple instances of data manipulation at Cryosphere Today. 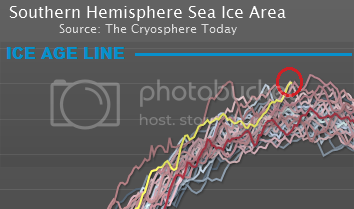 For those of you who don't know, Cryosphere Today is a source of sea ice data which Alarmists use to claim the Arctic is melting and so cannot be trusted. If I can discredit Cryosphere Today it means the Arctic can't be melting. The scientists thought they were being clever when they added the stars to the image. They thought it would make people believe the data was from a real satellite and not concocted in the lab like the rest of their faked science . But like all government IPCC scientists they tried to be too clever and made a mistake. You see unlike me, climate scientists have no knowledge of astrology refuse to work with professional astrologers . This has further implications for climate "science". If the IPCC don't understand the movement of stars, how can they properly represent the strong starlight forcing in their climate models? If they've got the starlight forcing wrong it means that starlight can perhaps explain all of the warming of the 20th century. That is assuming there has been any warming in the 20th century (Phil Jones says no). We all know that Arctic sea ice is naturally a reflective white. 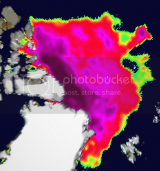 So why do the satellite images on Cryosphere Today show that it's red or pink? Is it possible that IPCC scientists have deployed some sort of dye into the Arctic environment (the same environment they claim to want to protect) which turns the ice a red/pink color? This certainly fits with what I've read . 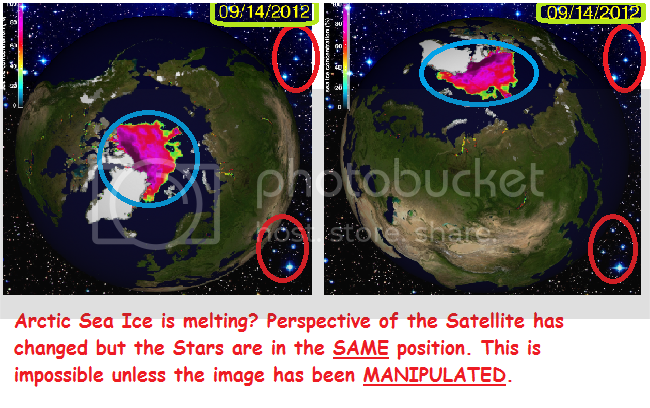 It seems there are only two options, either they admit their images are manipulated and the colors have been added in afterwards, or they admit they have sprayed the arctic red for some nefarious purpose. Red and pink coloration of the ice in almost dye-like patterns. Hmm..
Why would they want to turn the ice red? I never pretend to have all the answers, only that I can obtain them within 24 hours. To this end I have been in deep discussions about this subject with several chemtrail experts and they assure me it would be possible, if not entirely expected, for the government to spray red dyes from jet planes flying over the Arctic ("Exactly where no-one is around to see them doing it", one expert told me). As for the motive, I am sure it's an attempt to melt the arctic to fit the IPCC's failed predictions. Everyone knows the color red is associated with heat (except when it's used to highlight the spot of interest in mineral promotions), so the dye is probably hot. If the Arctic does melt: just remember the scientists probably did it with their chemtrails and it wasn't CO2 and so taxes are unnecessary. Having decided to poison the Arctic with red dyes and photo-shop fake stars into an image, it's perhaps not surprising that climate "scientists" would take the next step of entirely stripping all the clouds from satellite images. Okay sure, maybe the 14th of September was just a cloudless day you might say, but I audited a whole 3 months of Cryosphere Today images and saw not a single cloud. That's IMPOSSIBLE! Climate scientists dislike clouds because clouds contradict their PCAGW myth . If there are clouds then everything is fine . The most likely explanation is that they are so used to deleting clouds from Climate Models that they deleted them from satellite images too without thinking.